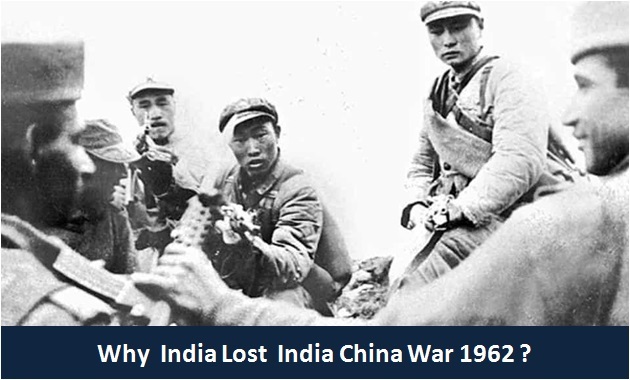 India China War Of 1962 | Why India Lost Sino-Indian War 1962 ? The India China War is a story of betrayal of Indian friendship and trust by China . Sino-Indian War was also an outcome of some of the biggest and worst blunders in India’s strategic planning and diplomacy . The opposition parties blamed the government of the day for its failure to access the deteriorating situation on the border and reading the Chinese intentions. The Indian defeat in this war is an outcome of continuous neglect of Indian Armed Forces , and this was the saddest part of the 1962 war. The 1962 war , is also a story of , how political interference in army’s command structure , can lead to , disastrous consequences. This war had also exposed , some serious gaps in Indian strategic planning and defences. It is important to uncerstand these historical facts so that we do not allow this to ever happen again in future. The India China war was started by China on 20th October 1962 with the invasion of India by the Chinese army . The India China war lasted for almost a month and ended on 22nd November 1962 with unilateral cease-fire declared by China . In this Sino Indian war , India had lost strategically important Aksai-chin area of the Indian territory to China and almost three thousand brave Indian soldiers who laid down their life and fought till their last breath. The wounds inflicted by China to India during this Sino-Indian war has still not healed even after the passage of over fifty years. This war has taught many important lessons to India and was a turning point in India China relations. The wounds inflicted by this war on India , during this Sino-Indian war has still not healed even after the passage of over fifty years. This war has taught many important lessons to India and this was a turning point , in India China relations. In order to understand the chain of events that led to this war , we must look back in the history , and how India China relations had evolved between 1950 onwards till first India China war , in 1962 . Both India and China got their independence more or less at the same time but each followed different ideologies. China opted for single part rule communist model and India followed a democracy . In order to understand India China relations before India China war , we need to look back in history . The Chinese civil war fought during 1927 to 1950 between the Nationalist party of China and communist party of China . The Nationalist Party of China was led by Chiang Kai Shek which was supported by western countries including US. whereas the Communist Party Of China was led by Mao Zedong which was supported by Russia. During Chinese civil war , Japan had invaded China and occupied some Chinese territory . However , with defeat and surrender of Japan after the end of second world war , The Japanese occupation of China also came to an end . The Chinese civil war ended with the victory of communist party which controlled the major part of China and the creation of the People’s Republic of China. The Chinese communist party had eventually taken the firm grip on China by 1949 after a prolonged battle with China’s Nationalist party . The Nationalist Party lost the civil war and was restricted to the newly formed state of Taiwan . The newly formed Peoples Republic Of China ruled by the Communist party initially faced major challenges and had to struggle for its recognition as a legitimate representative of the state of China. The western countries including the United States were against the communist party ruled China and supported the Nationalist party ruled Taiwan which was a democracy. During this time , India provided crucial support to the communist party ruled China in getting the crucial recognition. In fact , India became the first country to give this crucial initial recognition and established formal diplomatic ties with the newly formed the People’s Republic of China. The Indian government led by Prime Minister Jawaharlal Nehru declined the most important permanent seat at UN security council offered by United States to India and instead passed this crucial seat to China in 1960 . This decision by PM Nehru had serious ramifications for India . India is still paying the price for allowing China to get a permanent seat in UN Security Council. China is now misusing the veto power against India to provide a shield to an international terrorist and Mumbai attack mastermind Hafiz Sayyed. In post independence period , India China relations were quite good despite the existence of unsettled border dispute between the two countries . The Indian government led by Congress party had continued its policy of extending full support to China on all important international issues including the illegal occupation of Tibet by China . The western countries led by the US had opposed the illegal occupation of Tibet by China . The Indian blind support to a communist party ruled China on many such issues was one of the important reason why US policies were not favourable to India during this period. There was a regular exchange to visits between the leaders of China and India during this period . The warmth in the relations due to frequent mutual exchange visits led to the famous Panchsheel agreement signed between the two countries in year 1954 . The leadership of both the countries agreed to lay down the foundation of India China relations based on the five principles of peaceful coexistence, known as the Panchsheel. Tibet was an independent Buddhist nation in the Himalayas land locked between India and China along northern front of Indian border . Tibet was a peaceful Buddhist country and had little contact with the rest of the world . Tibet was ruled by its political and spiritual leader Dalai Lama. By now the Chinese communist party had firmly established itself and the Chinese government led by communist party Chairman Mao Zedong and Premier Zhou Enlai . The annexation of Tibet by China was in fact the beginning of Chinese expansionist policies and the Chinese army invaded Tibet . China annexed Tibet and declared Tibet as part of China in year 1959 .The Chinese illegal occupation was vehemently opposed by Tibetan people led by their spiritual leader Dalai Lama. Surprisingly, despite strong objections raised by western countries and the US , the Indian government decided to remain completely silent on this Chinese invasion of Tibet. The Communist Chinese invasion of Tibet in 1950 led to the revolt against Chinese occupation and years of turmoil . The Chinese military action against these protests led to the complete overthrow of the Tibetan Government led by Dalai lama. The Tibetan spiritual leader Dalai Lama along with 100,000 Tibetans moved to India in self-imposed exile in 1959. The Indian government led by PM Jawaharlal Nehru decided to offer shelter to Dalai lama and a large number of Tibetan population purely on humanitarian grounds . However , India’s action to offer shelter to spiritual leader Dalai Lama created a major rift between India and China . Dalai Lama formed Tibetan government in exile in Dharmashala , in the Indian state of Himachal Pradesh . China viewed these developments as Indian support for the people of Tibet and their aspiration for independence from Chinese occupation. India and China share boundary that spread across three sectors . On Eastern Sector along Arunachal Pradesh and this area is also NEFA ( National Eastern Frontier Authority), the Central Sector along Sikkim and the Western Sector along Aksai –Chin area. China illegally captured Tibet and claims the Indian territory Arunachal Pradesh ( NEFA Area ) as south Tibet . China in the past had proposed to accept the Indian claim on Indian territory of Arunachal Pradesh ( NEFA ) in the eastern sector against the Chinese claim on Aksai-chin in the western sector. The NEFA region is the largest Indian territory claimed by China covering around 90000 sq. km and India have completely rejected the Chinese claim. This area was formally called as NEFA – North East Frontier Agency. During the 1962 war, the Chinese army had invaded almost 60 km inside the Indian NEFA region. However , after the cease-fire, the Chinese army went back to the line of actual control before the war respecting the international boundary ( McMahon Line ). China has claimed this entire area of Arunachal Pradesh and using this area as leverage to negotiate with India for strategically important Aksai-Chin on the western sector . And for this reason, China had recently objected to the visit of Dalai Lama to Tawang monastery as a reminder to its untenable claim. The 1962 India China war started with a dispute over the sovereignty of the widely separated Aksai Chin and Arunachal Pradesh ( NEFA ) border regions. Aksai Chin, claimed by India which belongs to Kashmir and also claims by China to be part of Xinjiang region . Aksai-chin contains an important road link that connects the Chinese regions of Tibet and Xinjiang. China’s construction of this road was one of the triggers of the conflict. China has accepted the Indian annexation of state of Sikkim as part of India in year 2006 . However , China wants to use the Sikkim card to pressurize the Indian government against Dalai Lama’s activities in India . The Chinese expansionism is threatening the smaller countries like Bhutan . China recently tried to construct road Inside Bhutan’s territory which is strategically important for India . India had to intervene to help Bhutan and deployed its army against China to stop the Chinese illegal activities . This led to the Recent standoff between India and China in Doklam area of Bhutan. China claims Aksai –Chin area of the Indian territory . China captured this area in India-China 1962 war and China did not vacate this area after cease-fire . Since then , this Indian area is under Chinese possession . The Indian Aksai Chin area was originally a part of the state of Jammu and Kashmir . China claims this Indian territory as part of its autonomous Xinjiang region. The Aksai-chin area is the second largest area claimed by China which covers over 38000 sq. km. However, this area is strategically important for India which mainly consists of uninhabited land. India firmly claims the entire Aksai Chin area forcibly captured by China and the Shaksgam valley . Pakistan had gifted Shaksgam valley area to China to settle the borders with China in 1960 . China also claims the Indian control over Daulat Beg Oldi where world’s highest airstrip is located . The Indian territory Aksai Chin was not being regularly patrolled by the Indian forces . India had also not developed any road network and other support infrastructure in Aksai-Chin area . Taking advantage of non-presence Indian forces in Aksai chin area , the Chinese unilaterally started the road construction and forward posts for the Chinese army . India’s lack of patrolling in Aksai chin area helped the Chinese to Constru the roads inside the Indian territory of Aksai-Chin without getting noticed by Indian forces . By the time these Chinese activities came to India’s notice , China had already built a road . India had strongly objected to these Chinese activities. In order to counter the Chinese activities, India started conducting regular patrolling and forward deployment of Indian forces along the border . By 1961 , regular skirmishes started between the Indian and Chinese forces deployed along the border and the Chinese forces started regularly attacking the Indian troops patrolling the Indian border . However , despite these Chinese provocations, the Indian political leadership failed to sense the Chinese intentions and also did not initiate any defensive measures to defend the Indian borders. PM Nehru had to face the worth of opposition parties who severely criticized his China policy . The main opposition party BJP led by Atal Bihari Bajpai had even brought for the first time a “No Confidence Motion” against the Congress government led by PM Nehru. The opposition also started building up within the Congress party against PM Nehru’s lenient approach to China. By 1959 , India China border witnessed a series of violent border conflicts between Indian and Chinese forces deployed along the border . The Tibetan people were up in arms against the Chinese occupation . After the 1959 Tibetan uprising, Indian leadership decided to give asylum to the Tibetan political and spiritual leader Dalai Lama. Dalai Lama along with 1,00,000 refugees had fled to India to avoid the Chinese atrocities . India had also initiated the Forward Policy in which mainly consist of forward deployment of Indian outposts along the border to strengthen the Indian position . As forward Policy , India built several posts along the north of the McMahon Line and also along the eastern portion of the Line of Actual Control . The Chinese Premier Zhou Enlai had proclaimed this position as Line Of Actual Control in 1959. The alarming rise in the frequent clashes between the two armies , it was evident that war is now imminent. Despite these events , the Indian leadership decided to remain in a false sense of security and no efforts were made to prepare for the war . In fact , PM Jawaharlal Nehru and his Defence Minister V K Krishna Menon were warned by then Army Chief General Thimayya, who had submitted a detailed report on the urgent measures needed to strengthen Indian defences. This report was ignored stating as alarmist. Unable to reach a political consensus with Indian leadership on disputed territory along the 3,225 kilometer ( 2000 mile) long Himalayan border and the fear of Indian intervention in Tibet, the Chinese army launched surprise attack simultaneously on two fronts in Ladakh and Chinese army troops also crossed the McMahon Line on 20 October 1961. This war was completely a one-sided war as neither the political leadership nor the Indian army had prepared for this war . Prime Minister Jawaharlal Nehru was in the state of shock as he had blindly trusted Chinese leadership and never expected China to launch an attack on India. As a result , the Chinese troops could easily advance over Indian forces in both the eastern and western sector . The ill-equipped Indian army soldiers were fighting with 2nd world war .303 bolt action rifles which could fire only one bullet at a time whereas the Chinese army was equipped with latest AK-47 automatic assault rifles. Due to lack of preparation , the Indian army could deploy only 20000 soldiers against 80000 well-equipped Chinese soldiers . Despite these limitations , the Indian soldiers fought and laid down their lives to defend the motherland. The Chinese leadership successfully managed to give a false sense of security to the Indian leadership .It was evident that China had been planning and preparing for this war for a long time . The Chinese army had very well prepared for this war and had established crucial supply lines to provide the necessary support to the advancing Chinese troops . China India war lasted for almost one month and ended with the unilateral cease-fire declared by China on 20th November 1962 as they had achieved the objectives . India had lost entire western front Aksai- Chin area and this area still continues to be under Chinese occupation. On the eastern front in NEFA ( Arunachal Pradesh ) area , The Chinese army had advanced 60 km right inside the McMahon line. However , the Chinese army went back to their previous positions after the war and vacated the area captured during the war on the eastern front NEFA region . Why India Lost India-China War 1962. The government of India appointed a committee to analyze Sino-Indian war and this committee submitted a report ( Henderson Brooks–Bhagat Report ) . However , the findings of this report have not been declassified by the Indian government till date . However , based on the media reports and the information available in the public domain, following factors were found to be responsible for India’s defeat in this India China war. Failure to assess the border Situation by Indian political leadership. Failure Of the Indian Defence Ministry. Leadership Failure by some Indian Army Officers. Lack Of Infrastructure along India-China Border. Lack of Preparation And Training by the Indian army. India did not use Indian Airforce. Superior Chinese Leadership, Planning And well-equipped army. The Indian Prime minister Jawaharlal Nehru’s China policy had completely failed and his personal friendship with Chinese leadership could not stop the Chinese invasion of India. PM Nehru could not access the deteriorating situation on the border and the Chinese intentions despite the chain of events and repeated attacks on Indian troops. PM Nehru’s personal ambition to become a world leader did not allow him to take a firm stand against the Chinese expansionist policies and the opposition parties often severely criticized his soft approach to China. India did not protest or opposed the Chinese annexation of Tibet. India also failed to align with western countries including the United States against the Chinese aggression on Tibet. India also did not raise the issue of illegal Chinese occupation of Tibet at United Nations and the atrocities committed by the Chinese armed forces on Tibetan people who protested against the invasion of their motherland. PM Nehru also could not decisively act on the recommendations of the Indian army General K S Thimayya who served as Indian Army Chief during the crucial period of 1959 to 1961 . The 1962 India China war and subsequent Indian defeat was a major blow to PM Nehru . He had never expected such betrayal by China . His famous slogan of “Hindi Chini Bhai Bhai “ had turned in to open hostility between the two countries . The Indian Defence Ministry was headed by defence minister V K Krishna Menon who was also considered to be very close to the Prime Minister Jawaharlal Nehru and he was considered to be the second most powerful person after the PM. One of the most important factors responsible for India’s defeat in this war was lack of preparedness of Indian armed forces especially the Indian army . During his tenure as defence minister , V K Krishna Menon is severely criticized for his failure to modernize the Indian Armed Forces . He is also accused of completely undermining the impending Chinese threat. During this war , the Indian infantry soldiers were fighting with world war 2 .303 bolt action rifle whereas the Chinese soldiers fought this battle with latest automatic AK-47 assault rifles . The most glaring and serious lapse during his tenure as defence minister was his failure to act on the Report recommended by then Army Chief , General K S Thimayya . This report warned and highlighted the impending threat of Chinese attack and required preparation by the Indian army. General Thimayya had recommended to strengthen the Indian defences based on the Report submitted by deputy Lt-Gen SPP Thorat who had prepared a detailed report on the changing situation along the Chinese border in NEFA area and the impending threat of Chinese invasion. In his report , Lt-Gen Thorat had warned against the impending Chinese threat . This report was forwarded by General S V Thimayya to the Defence Minister Krishna Menon . However , Defence Minister Krishna Menon completely ignored this most important report and did not act on this crucial strategic input. The Defence minister V K Krishna Menon also had major differences with Army Chief , General K S Thimayya on many issues . Because of these differences , General K S Thimayya had even tendered his resignation which was, later on, he had revoked after the intervention from by PM Nehru . The Defence minister V K Krishna Menon had to resign in the middle of the ongoing war but he was continued as an advisor to PM Nehru . The 1962, Sino-Indian war also a culmination of failure of the Indian diplomacy although PM Nehru had sizable clout in international diplomacy . The Indian leadership and the foreign policy had failed to resolve the border dispute with China . The Indian leadership ignored the Chinese claims till 1955 . The alarm bell started ringing when China’s publications started showing major portion of western Aksai chin area and the eastern NEFA area as Chinese territory . However despite these provocations , the Indian leadership remained silent on these issues instead of taking up these issue with China through diplomatic channels. The Indian “Forward Policy” of deploying the post in forward positions along the area claimed by China also backfired . Further , these posts were not even provided crucial support including arms and ammunition . The Chinese forces started attacking these Indian forward posts . The Indian army also had its share of officers who failed to perform in crucial leadership roles . One such name which is prominently referred is Lieutenant General B M Kaul . During India China war in 1962, he was appointed as the commander of the IV Corps in the northeastern NEFA region . He was believed to be very close to PM Nehru and the Defence Minister V K Krishna Menon . His promotion as core commander was objected by Army Chief General Thimayya as he had experience and expertise only in logistics . He did not have any prior combat operations experience . He became sick on the first day of the war and moved to Delhi for his treatment . He was accused of not providing effective leadership during this India China war. The Chinese forces were relatively very well prepared and China had also created the necessary infrastructure including the roads. Whereas the Indian side was totally unprepared and the absence of roads caused major problems for providing the crucial supplies to the forward potions. The failure of crucial intelligence inputs and lack of such crucial information helped the Chinese army to keep the element of surprise in this operation . Till 1962 , India did not even have a dedicated external intelligence agency . This war was said to be the greatest intelligence failure in Indian history . However after the war , in year 1968 , the Indian government decided to establish the “Research and Analysis Wing “ ( RAW ) a dedicated external intelligence agency . The RAW was established in 1968 following the intelligence failures of the Sino-Indian War, This decision has helped India during 1971 war with Pakistan . The 1962 Sino-Indian war fought mainly between the two armies. The fear of escalation kept the Indian leadership away from using the Indian Air force. Although during this war , the Indian air force was relatively better equipped and its use could have been very effective. The Indian air force in 1962 had a sizable number of combat aircraft which includes Hunter, Mystere fighters and the Canberra medium bombers. The IAF inventory also had a squadron of photo-reconnaissance Canberra and some relatively old 75 slow speed , less capable Toofani and Vampire fighters and 30 Gnat Mk.1 fighters. The Indian reconnaissance planes had spotted the Chinese movements and road construction activities across the border. The subsequent analysis revealed that the use of Indian air force could have made a big difference in this war . By not using the IAF , India failed to leverage the upper hand in air superiority . The Chinese leadership managed diplomatic engagement with India with military precision. The Chinese leadership had successfully managed to keep the Chinese intentions and war preparation a closely graded secret. Subsequently , it was evident that China had been planning and preparing for this war for a long time . The Chinese leadership had successfully managed to give a false sense of security to the Indian leadership which helped the Chinese army to launch this attack which caught the Indian side completely off guard. The India China war could not get much attention due to Cuban missile crises which kept both Russia and the United States engaged . The international media was also distracted and remained focused on Cuban missile crises which brought the world close to the nuclear war . PM Nehru had approached President Kennedy for help . India being a democracy , US response was favourable to India .The US had come to India’s rescue and helped India with arms . US had also agreed to intervene and provide military support to Indian forces . Infect US plans were ready to send the USS Kitty Hawk aircraft carrier to the Bay of Bengal to support India . Surprisingly , the Soviet Union , India’s old trusted friend took a neutral stand in India China war despite its serious ideological differences with China. The Soviet press reports also tilted towards China. The Soviet Union’s tilt towards China became clear when the Soviet Union suspended the crucial supplies for MiG fighters under the agreement reached between the two sides in August 1962 .However these supply was resumed after the war was over . Has India Learned any Lesson ? And the answer is unfortunately , NO . Let us face this reality. The India–China border dispute still continues to be unresolved. The Indian territory of Aksai Chin captured by China during the war , continues to be under the Chinese possession . The discussion between India and China at various levels have so far not yielded any meaningful resolution. Both Indian and Chinese economies have grown and also the military might . However , the gap in the military capabilities has grown in China’s favour . The Indian military capabilities could not keep the same pace as that of China during the Congress party rule of seventy years over India , after independence . The reports of corruption scams in major weapon system acquisition programs during the Congress rule deprived the Indian armed forces from getting the latest weapons which has adversely affected the Indian military modernization program . Although , there has been considerable improvement in Indian military modernization process after Narendra Modi government came to power in 2014 . The Modi government has also initiated major construction projects and the development of road network along India China border to improve the border infrastructure . However , the gap between India and Chinese military capabilities is considerably high in Chinese favour . For example, China has already developed fifth-generation fighter aircraft whereas the Indian forth generation LCA Tejas fighter project is still in the development stage . There has been a considerable decline in Indian Air Force combat capabilities primarily due to the declining number of IAF squadron numbers. The Indian Air Force squadron number has declined to a dangerously low level of 31 squadrons as against required strength of 42 squadrons needed to effectively face the two front war . The Indian political parties compulsions to politicize every major weapon acquisition program for the armed forces runs into some trouble , which is adversely affecting the Indian military modernization program . The recent Rafale Deal signed by Modi government with France is another example of how a conflicting political interest can override the national interest . The French Rafale is a 4.5 generation fighter which can give Indian Air Force a clear edge over its adversaries . The India China relations have been severely affected due to unprovoked Chinese aggression . Although the economic and trade relations between the two countries have considerably improved because it is in Chinese favour . The booming Indian economy and rapidly growing consumer market in India offer huge potential for Chinese companies. It is now clear that , China at this point of time does not want to settle the boundary dispute with India for obvious reasons . China views the booming Indian economy , and the rapidly growing Indian military strength , as a serious potential threat to its main objective of being a superpower , by dislodging the United States. China is equally concerned, about the growing warmth in relations , and the strategic alliance shaping up , between India and US . However , China is pretty much aware of the Indian weakness , and the vulnerability. China believes that in the event of military conflict with India , China will have upper hand and therefore , keeping the border dispute unresolved suits China at this point of time . The Chinese army , still regularly intrudes into the Indian territory without any fear , deliberately to keep the pressure on , On the Indian leadership and also as a reminder to keep the untenable Chinese territorial claims . Further, China will continue to take such liberties with India in future , primarily due to limitations of Indian responses to such border violations by China. As a counter strategy, India needs to rapidly modernize its armed forces , and build the military muscle, to create effective deterrence and then negotiate with China from the position of strength. India should also continue to play a leadership role in forging the QUAD alliance, rapidly shaping up between the United States , India , Japan , and Australia. The QUAD alliance is necessary, for the regional security and to contain the Chinese territorial ambitions and expansionist policies under control. The recent standoff between Indian and Chinese armies at DOKLAM, is clear indication of Modi government’s resolve , to take the China head on , if required. The Chinese hostile attitude and anti-India policies will be counterproductive, which will push India, to play a crucial role, against the Chinese interest. The border dispute with China , can be resolved, only when India significantly improves its military capability , which will allow India to negotiate with China from the position of strength . China is currently exploiting the Indian weaknesses, in the military capabilities, as a result of continuous neglect , by successive Indian governments. whereas , the main Chinese objective, is to contain India , under the pretext of the border dispute. India Cannot be a financial superpower, without being a military superpower. India also needs to develop, closer economic ties with China , on mutually beneficial terms . The Geopolitical compulsions constrained China , to settle the border dispute with Russia. Similarly , The ongoing Chinese trade war between the US and China , might create a favourable situation , for both India and China , to enhance the trade relations and settle the border dispute , once in for all . This is a crucial period , for both , Chinese and Indian economy . China needs the Indian market , and India needs Chinese Investment. And therefore , India should continue to engage with China , to find a political resolution , to the border dispute between the two countries. We can only hope , at this point of time , that rationality would prevail , and Both India and China will soon workout , a win-win solution.